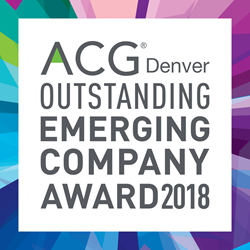 ACG Denver proudly announces the winners of the 2018 Corporate Growth Awards. The awards were delivered to the winners during ACG Denver’s annual Rocky Mountain Corporate Growth Conference on March 6, 2018 at the Hyatt Regency Denver. Each year, the awards are given to two companies headquartered in Colorado for their excellence in growth strategies. The “Outstanding Corporate Growth Award” celebrating companies with revenues in excess of $100 million went to BluSky Restoration Contractors. The “Outstanding Emerging Company Award” honoring a company with revenues between $10 million and $100 million went to Accucode, Inc.
Accucode is a software developer and technology integrator specializing in the application of mobile computing, wireless infrastructure, and automated data collection technologies. Accucode pioneered the Hardware-as-a-Service model under which fully managed tablets, software, and other technologies are delivered at a fixed subscription rate, removing capital barriers and mitigating maintenance and other life-cycle risks for customers. Accucode provides cost-effective solutions for warehousing, retail, manufacturing, transportation, healthcare, government, and education. Accucode has built a reputation of excellence by providing its clients with turnkey, best-of-breed solutions backed by the company's proven expertise and world-class service. Founded in 1954, the Association for Corporate Growth has chapters worldwide representing 14,500 members. ACG serves 90,000 investors, executives, lenders and advisers to growing middle-market companies. ACG's mission is to drive middle market growth. The Denver Chapter of ACG was established over 20 years ago and provides access to the people and ideas to help grow companies.